I got to try a lot of new beers and beer styles in 2010 and did more to expand my palate this year than in any previous year. It was actually quite difficult to narrow this list down to the ten absolute BEST of the 185 beers that appeared on Chad'z Beer Reviews this year. Only SIX beers scored a perfect "10" and another 21 garnered a "9". Let me just clarify that this is NOT meant to be "The Best Beers Ever Made". I'm also NOT arguing that there is a factual superiority between these beers in objective or artistic "quality". I don't caught up in those arbitrary, masturbatory debates. If you want such philosophical arguments, I suggest you check out the more pretentious, snobbish beer critics out there. This list is just my PERSONAL PREFERENCE. Everyone has a different sense of taste and, to me, these are the beers that taste the best. It had to have been reviewed on Chad'z Beer Reviews during 2010. If I didn't review it this calender year it doesn't qualify. It had to my first time reviewing it, re-reviews don't count. If it was a vintage, it counts as a new beer, since a beer can change greatly from year to year as it ages. An annual release whose recipe changes from year-to-year counts as a new beer. Beers I only wrote text reviews of weren't eligible. This list was NOT limited to beers released in 2010. Many of these beers have been around for years - I just haven't reviewed them until 2010. NOTE: Many of these clips are taken from reviews with a guest reviewer. For each beer, I tried to narrow down the best 50-70 seconds of ME explaining why I graded them the way I did. So if it looks like I'm cutting off the guest reviewer or censoring them - I'm not. There's just no way to get in both my thoughts and the guest's thoughts in without making this a long, 20+ minute video. Three Floyds Dark Lord is kind of like the Westvleteren 12 of the USA. It's only brewed once a year and the only way to get it is to go to the brewery and wait in line on a certain Saturday in April. Two flavors in one: red wine taste up front; bittersweet dark chocolate on the finish. Very rich. As it warms more fruity flavors open up: cherry, plum, molasses. Alcohol presence noticeable and somewhat distracts from the palette. One of my small pleasures in life is taking my first swig of a new IPA and loving the taste. That was definitely the case with Bell’s Hopslam Ale. Just as the aroma indicates the first flavor I notice is a tart citrusy, almost juice-like taste. It’s actually quite refreshing not unlike a cold glass of lemonade on a hot summer’s day. The beer finishes with a slightly dry, honey-like malty sweetness. The aftertaste is strong with a noticeable pine and resin-like bitterness. Surprisingly, it does not dry out the tongue the way many standard IPAs tend to do. I’m not sure of the IBU rating for this beer but I’d estimate it’s in the 60s or 70s as the bitterness is quite strong, but seems to back off on the way down. I’m actually a little surprised the hops do not linger here. I’m also surprised the citrus flavors quickly fade and the palette becomes almost exclusively pine-like. It’s definitely a satisfying taste but it doesn’t exactly knock my socks off the way the word on the street implied it would. I’ve never tasted a flower but if I did I’d imagine Ithaca Flower Power IPA is probably what they would taste like. With a refreshing floral and slight citrus taste, this is a beer with a delectable, satisfying palate. Up front and in the middle I get an orange juice-like flavor: it’s a little tart but also thick and soft. As the beer finishes there is a strong hop bite and a rich piney aftertaste. It’s rare an IPA has all three flavors of citrus, floral and pine - but that just goes to show the craftsmanship of Flower Power. The only caveat to this beer is the dryness on the end seems to be a bit too dry. It’s got the bitterness I expect from an IPA, but the pure arid dryness is a little stronger than I prefer. There’s also a honey-like sweetness that is present in the aftertaste. It’s a lighter, candy-like sweetness, which complements the dry finish, but I think a richer, more caramel-like sweetness would have rounded out the palate perfectly. Still, it’s a really tasty beer with a lot to like. I’ve often found that the more highly-acclaimed a beer is, the more complex its palate. Belgian beers, especially Trappist brews, are known for being so complex that each sip is different than the one before it. Perhaps the best way to describe the taste of Westvleteren 12 would be to simply list adjectives: red wine; oak; Macintosh apple; cherry; vanilla; caramel; dark chocolate; fig; plum; bread, and alcohol. While I would say this beer is indeed very tasty and appealing, it’s not to the point of being absolutely delicious. The palate is not quite as intense as you’d expect. The flavors begin to light up your palate as soon as they touch it with the aforementioned dark fruit flavors. The middle is noticeably dry with a slight chalky taste of malts and a touch of sourness. The finish is a surprise, though, with rich caramel and dark chocolate sweetness followed by a bitter aftertaste that lingers shortly. Westvleteren 12 is definitely tasty and complex, but as impressive as it may be, this is still not the most delectable palate I’ve ever encountered. The intensity seems a little lower than it should be, with the alcohol taking some attention away from the palate. Dieu Du Ciel describes Aphrodite as a “cocoa and vanilla stout,” which is already very intriguing before even tasting it. Sure there are plenty of stouts which describe themselves as “chocolate” but this beer intends to be a little more complex. It was apparent to me from the first sip that was indeed true. The head itself is rich, sweet and chocolaty and once the beer itself hit me I was in love with it. Immediately my palate is saturated with a rich milk chocolate-like flavor followed by a lightly roasted malt finish. There is a distinct, but fairly mild bitterness in the aftertaste. 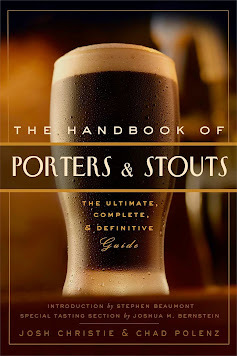 Unlike a baker’s chocolate aftertaste in other chocolate stouts this beer is noticeable sweeter – most likely due to the usage of vanilla bean in the recipe. Aphrodite is not, to my knowledge, oak-aged, but there is a distinct earthiness to the finish. This could be explained by the fact the brewery lists bourbon among the notable flavors to the palate. this taste becomes more noticeable as the beer warms and because this is not an imperial brew, it’s actually quite inviting. My first sip of Troegs Nugget Nectar was akin to taking a huge gulp of tropical fruit juice after being parched for days - not only was it extremely refreshing, but the taste was wonderful. Immediately I get a tart, bitter taste of grapefruit, orange and passion fruit. As the beer finishes the malts take over to deliver a sweeter component of confectionery sugar. It’s a great one-two punch of satisfying flavor. The hops linger for only a little while with this beer. There is a noticeable dry aftertaste, similar to East Coast-style IPAs with a sticky, dry, piney resin coating but not quite as intense. This is an amber ale after all, so the beer is a bit drier than an India pale ale. Still, the flavor combinations of citrus and sweetness really add up to form an impressive palate. What’s interesting is this beer uses nugget, warrior and tomahawk hops for an IBU rating of "93ish" according to the bottle, yet it doesn’t taste quite that bitter. It’s also nice to drink a hoppy beer that utilizes these types of hops instead of the usual cascade variety. Delicious dark chocolate not overdone. Nice gentle bitterness with a touch of pepper in the aftertaste. Oak aging gives a slightly smokey and woody taste in the finish. Robust but smooth. Just like the aroma - a floral bomb. Great double IPA taste with lots of hops. The lactose sugar gives it a creamy texture, but it remains crisp. Extremely robust and bitter. Manages to combine flowers, citrus and touch of pine while remaining very satisfying. Sometimes a beer is so good it’s almost hard to explain the taste. Pliny the Elder is not what I would consider a "complex" palate in the traditional manner, but the tastes that are there are so strong and so delectable it’s an absolute joy from the first sip to the last drop. Much like the nose, the body is a mash of sweet tropical fruit juice made from orange, tangerine and grapefruit, with perhaps a bit of mango or papaya. It’s tart like a glass of freshly-squeezed lemonade but without the sugary notes. The hops make the palate very crisp, but just like the scent, they finish clean. I’ve had other IPAs from around the country that are so highly hopped and bitter they tend to tear up my palate like eating and entire box of Sprees or Sour Patch Kids. While Pliny the Elder is noticeably bitter throughout, the aftertaste is surprisingly gentle and quite refreshing.